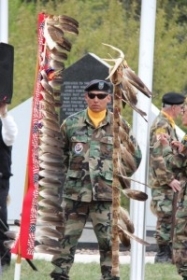 Commissioned by the Lac Courte Oreilles Band of Lake Superior Chippewa, my most recent creation, Eagle in Flight, was unveiled to the public during a moving Memorial Day tribute to veterans on May 27, 2013. Eagle in Flight is one component of the work in progress LCO Ojibwe Veterans Memorial being constructed on the corner of County Highway E and K just outside of Hayward, WI. Scheduled for completion and formal dedication on Veterans Day on Monday November 11, the tribute to Ojibwe Veterans will be a focal point of remembrance to service to our country. I was honored when Tribal Chairman Gordon Thayer asked me to be a part of the Veterans Committee that was coordinating the memorial development. It was a pleasure to work with the Meyer Group, P.C. (http://www.meyergroupduluth.com/) from Duluth, MN who is coordinating the architectural components of the memorial. Installation partners from LCO Development insured that the installation went smoothly and professionally. Special thanks to Jack Moin and Dan Malesevich for their transportation and logistics assistance as well as to technical partners Paddy & Linda Steavenson for their help on the project. Throughout my my artistic journey, I have created four similar style three-dimensional eagle sculptures. The first, Flight of the Four Seasons resides at the State Bank of Drummond branch on County Highway M and Kavanaugh Street in Cable. A fifth eagle currently being fabricated at my Dragonfly Studio will make an appearance in Cable’s July 4 parade before final installation and unveiling as part of the Town of Namakagon’s Centennial Celebration on July 6. 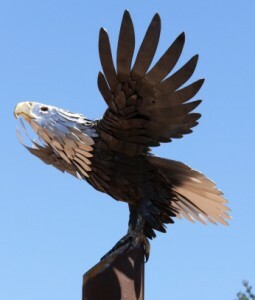 Each eagle sculpture is unique in detail, placement and purpose. As you will see from the photo gallery, Eagle in Flight is a complex construction requiring a supportive steel skeletal framework. Many Corten steel and stainless steel feathers are added to the framework. The beak and claws have brazed brass highlights providing a realistic texture and color to those components. The six-foot wingspan of the LCO Eagle in Flight sits atop of a metal cap that slides over an eleven-foot tall ten-inch base. Perched high above the viewer, one senses that the majestic bird is ready to soar in the sky above. When the installation was complete, everyone working on the project looked skyward to see a live eagle in flight soaring overhead beaming down its approval. During the ceremony, Tribal Chairman Gordon Thayer and other LCO Trial Government officials and guests presented portions of the veterans program. 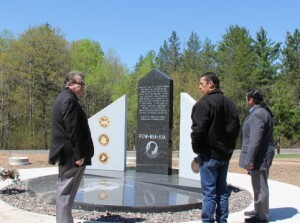 Included were a reading of World War I veteran’s names and presentation of commemorative plaques to seven attending Ojibwe World War II veterans. Welcome and Flag Songs were performed by LCO Soldiers Drum and a Traveling Song performed by Waadiikodaading students. The commemorative recognitions touched everyone in attendance. Throughout the summer, the renovation of the Kinnaman School will continue as well as development of the memorial grounds. When completed the school will be a cultural center and focal point of the memorial grounds. Also scheduled for completion is an open-air pavilion, landscaping and addition veterans tributes. 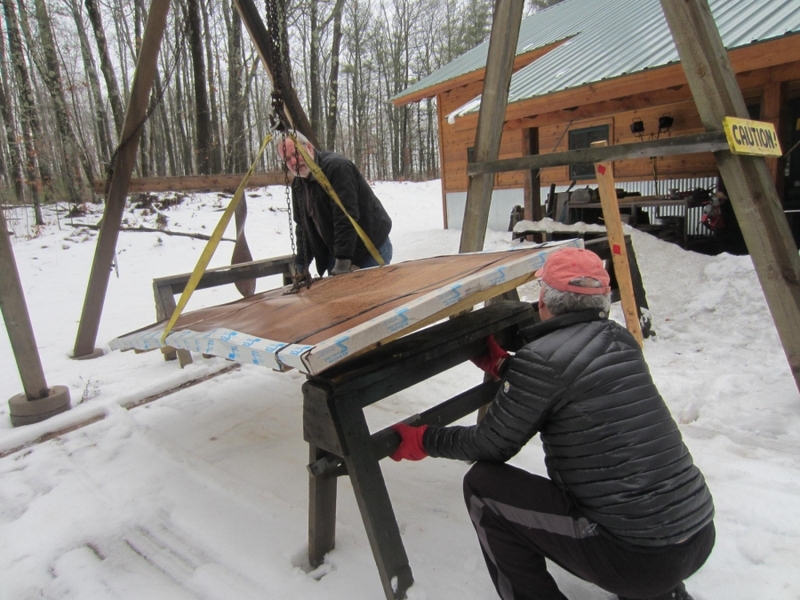 As a part of the November Veterans Day 2013 dedication, I am creating a steel and stainless sculpture of the LCO Veterans Eagle Staff that will be added to the LCO Ojibwe Veterans Memorial. I will add photos to this post when that sculpture is complete.